Just over a year ago I lost a very important person in my life. 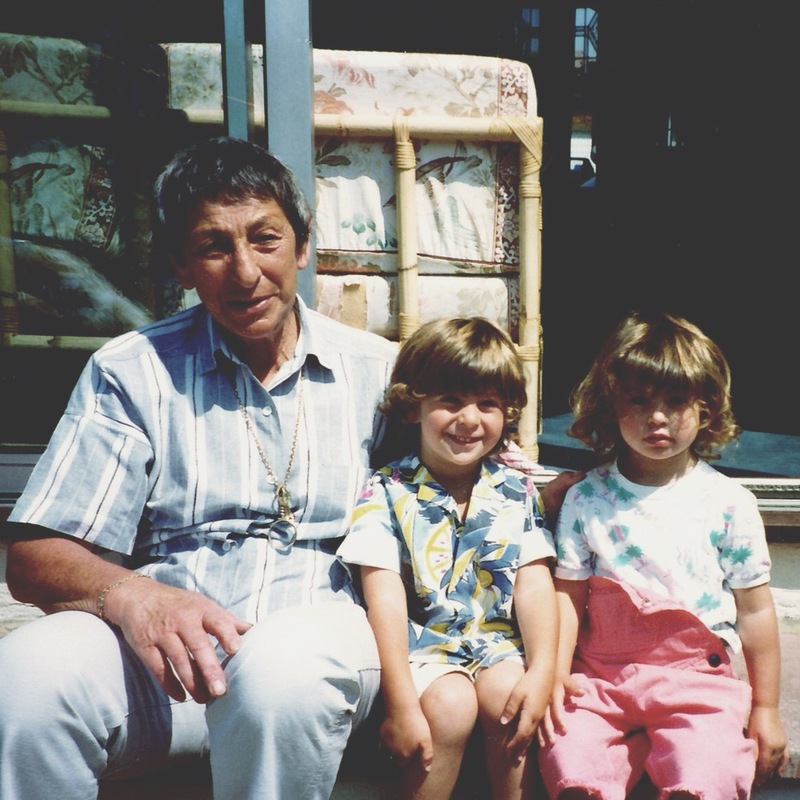 A constant and irreplaceable figure of love, acceptance and generosity, my grandmother. Despite her tiny stature, my maternal grandma was a monumental woman in mine and my brothers' lives. Every Saturday we would meet for lunch and coffee, and when we were children we'd play in her house and garden, my mother’s childhood home. We would sit in her living room watching our favourite tv shows that she had recorded off the tv for us and eat pomelo. As we got older she continued to care in every way she could. She nurtured my strengths and encouraged my passions. She bought me a new book, a bag of nuts and a chocolate bar each week. She would visit the major galleries and sent me postcards from all the exhibitions she saw with a short note on the back letting me know what she thought. She charmed everyone she met with her strong character, sharp wit, her intellect and kind humour, leaving the most wonderful impression on everyone she met. When she passed away, aged 93, it was heartbreaking. Every memory I had became infinitely more precious as I cherished her and felt all the ways she shaped me into who I am today. It became important to me to find a way to honour her, to keep her close to me and pay tribute to her unending significance in my life. As a jewellery designer, I naturally turned to jewellery. For me, one of the most beautiful things about jewellery is how it can express incredibly personal and loving connections between people and this is something I wanted to capture and create with my beloved grandma in mind. While I contemplated ways to keep my memories alive and her presence close I looked at the jewellery she had given me and other pieces that have been passed down to me. Among the rings and pendants in my jewellery box are two lockets from that I hold especially dear. 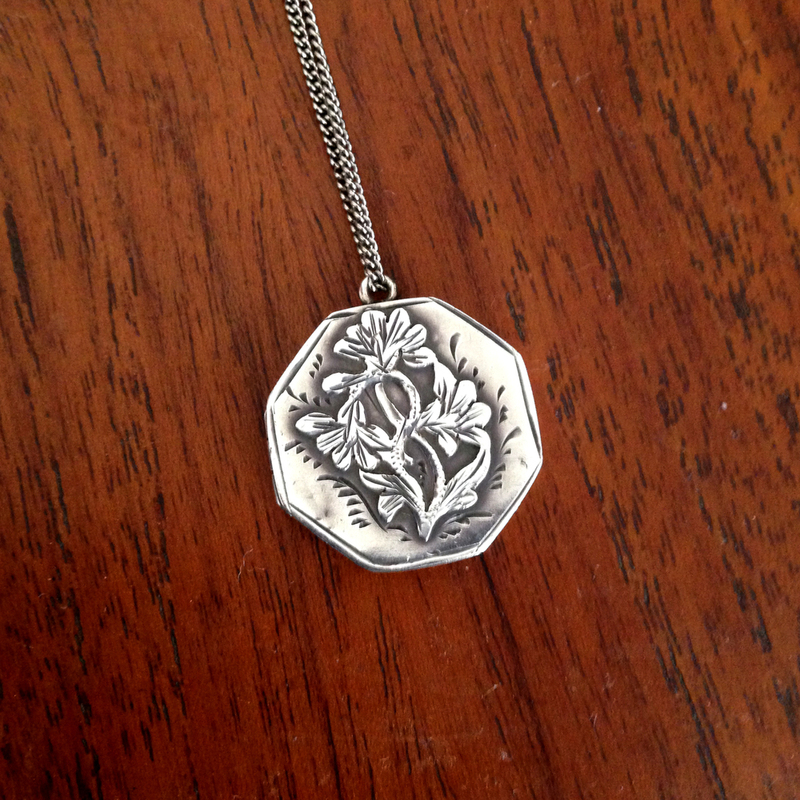 One of the lockets was from my great grandmother to my mother and is very delicate, a small silver octagon with a floral design on the front and inside are two red cut out hearts from my mother. 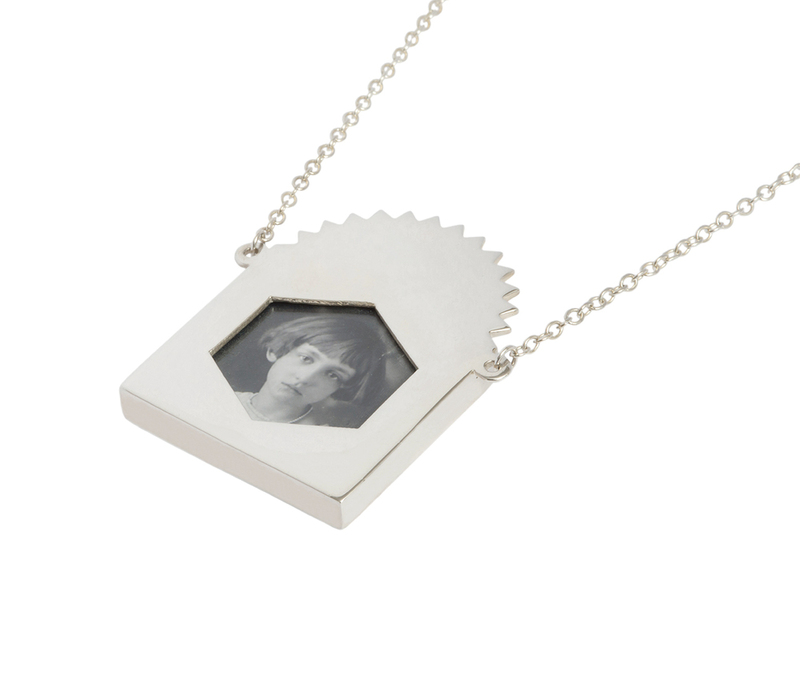 The other locket is a bold oval and is personalised in every way. On the front are her initials ‘BS’, around the edge is an inscription which reads ‘To my wife Bertha, with all my love Archie. July 1st 1950’. Inside are two photographs, one of my grandparents and one of my mother as a baby. It’s the deeply personal characteristics of this locket that makes it so meaningful and inspired me to create a piece of jewellery that enabled a loved one to be cherished, kept in mind and close to heart. However, unlike the traditional closed and private nature of lockets I decided to create a piece that was outwardly personal, not just a way to treasure, but also a bold declaration and celebration of someone special. 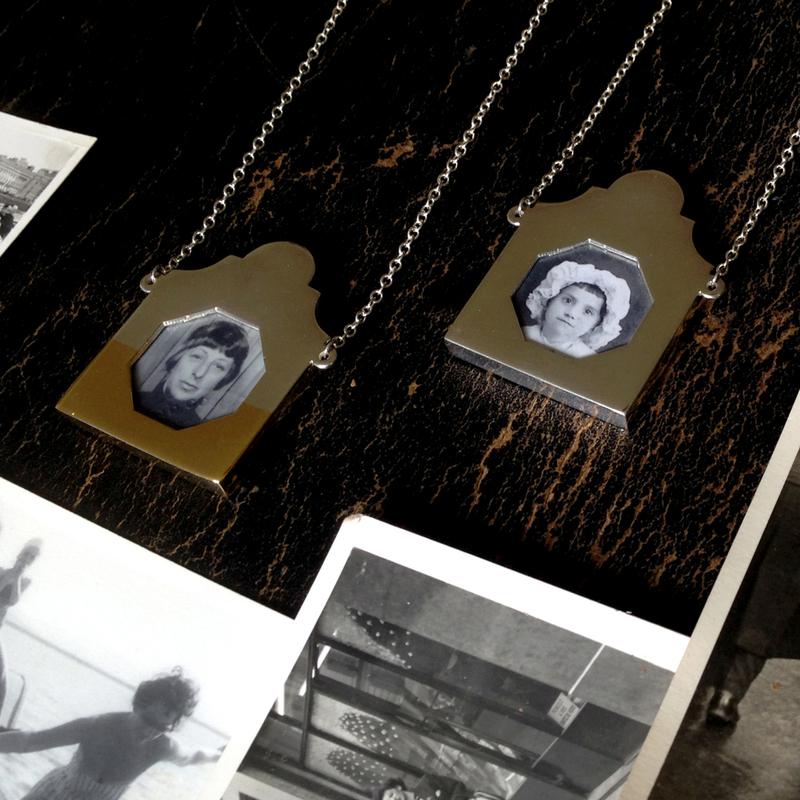 Inspired by holy shrines and historic reliquaries, I created this series of necklaces that enshrine the memories of those we hold dear and keep them close. 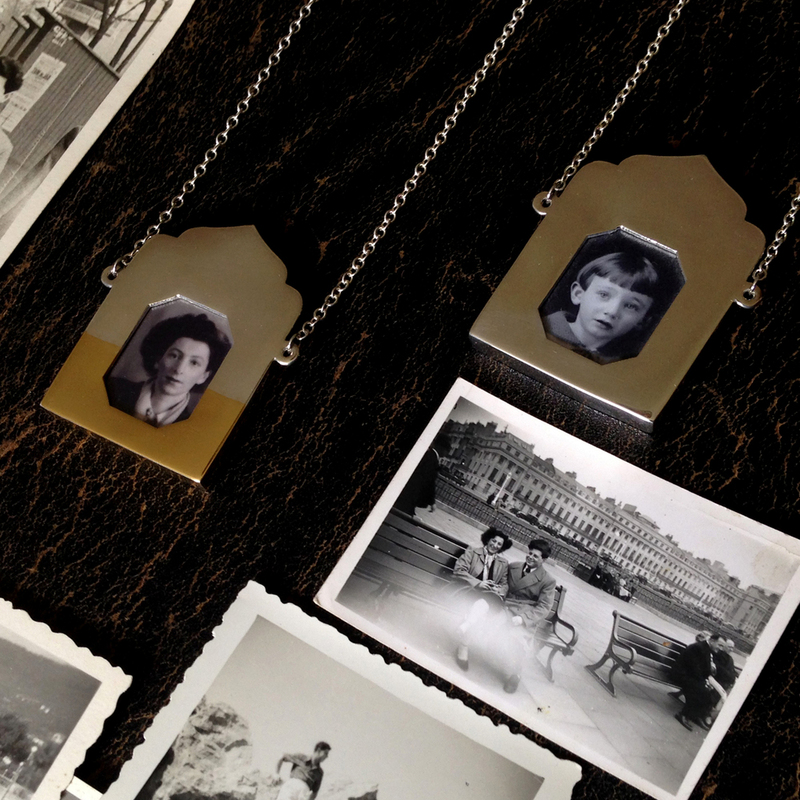 These elegant open locket pendants frame our affections, memories and the sentiments we wish to cherish; whether in the form of a photograph, a pressed flower, or a lock of hair. These statement necklaces invite adoration with their striking geometry, inspired by spaces and objects of worship from different cultures. Available in three distinct designs ‘dearest’, ‘beloved’ and ‘darling’ the pendant is the keeper of stories and a timeless symbol of their permanence. Both simple to compose and customise, the pendant allows it’s wearer to curate and reveal infinite sentiments. A year and a half ago I proposed to the man of my dreams and from that proposal, came my marriage, my company and my Hoyz ring collection, pretty sweet deal if you ask me. Let me explain how my jewellery collection and brand came out of my engagement story, as for me, it’s so perfect and makes so much sense. After I proposed to my husband, and he evidently said ‘yes!’ (actually it was “Is this for real? oh my god, yes!) we started talking about rings, of course. Being observant Jews with a love of antiques and old things, he reminded me of the incredibly beautiful and special antique Jewish wedding rings of Europe. The amazing story of these almost lost treasures is outlined in this previous post, but I’ll briefly explain. These wedding rings were truly works of art, demonstrating exquisite craftsmanship. They all feature charming, miniature palaces, castles and temples that represented the ancient Temple in Jerusalem as well as marital home of the new couple. 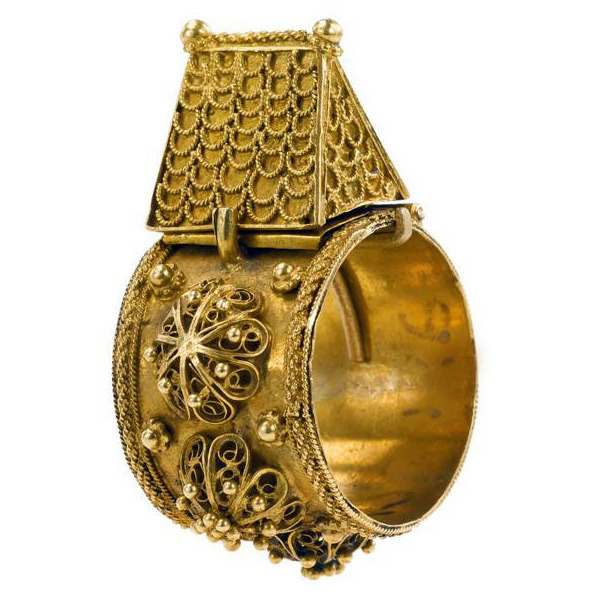 Popular between the 14-18th centuries, a number of spectacular examples of these rings have survived, although the tradition was almost lost and few Jews know of these rings today. Both my husband and I had been enchanted by this wonderful tradition and connected with it in a number of ways. The house is a very important symbol in Judaism, as the home and family is truly the focus, the heart and of utmost importance in Jewish life. Now I need to explain that my husband is literally the most generous and thoughtful person ever, knowing how much I liked these rings he tracked down an auction selling them and asked if I wanted one! However, although breathtakingly beautiful, the original house rings are not a practical engagement ring as they are large and were not designed to be worn after the wedding ceremony (at least not on the finger, but possibly on a chain around the neck). With a solid background as a designer and maker, my initial and most authentic reaction was that I would make our engagement rings, inspired by the original house rings. We both felt that these rings perfectly represented the life we wanted to build together, as as a designer- maker, creating our own house rings felt so right. As well as expressing our love of antiques and Jewish tradition, in making our rings I could express another vitally important aspect of my life as a designer. As I began work, making while contemplating the meaning and historical significance behind the house ring and what it meant to us, I also began talking about them to people. As friends and acquaintances asked to see my ring and I explained what I was making, I was surprised to realise that almost everyone was hearing about these rings for the first time! Most people knew nothing about them, but were fascinated by the story. I felt that these rings were far too special to be forgotten and I decided then to not just design our engagement rings, but to design a collection of rings to share the story of the tradition. And so, I began work on three different house ring designs, in four different but equally gorgeous finishes, that would comprise the Hoyz ring collection, ‘hoyz’ meaning house in yiddish. 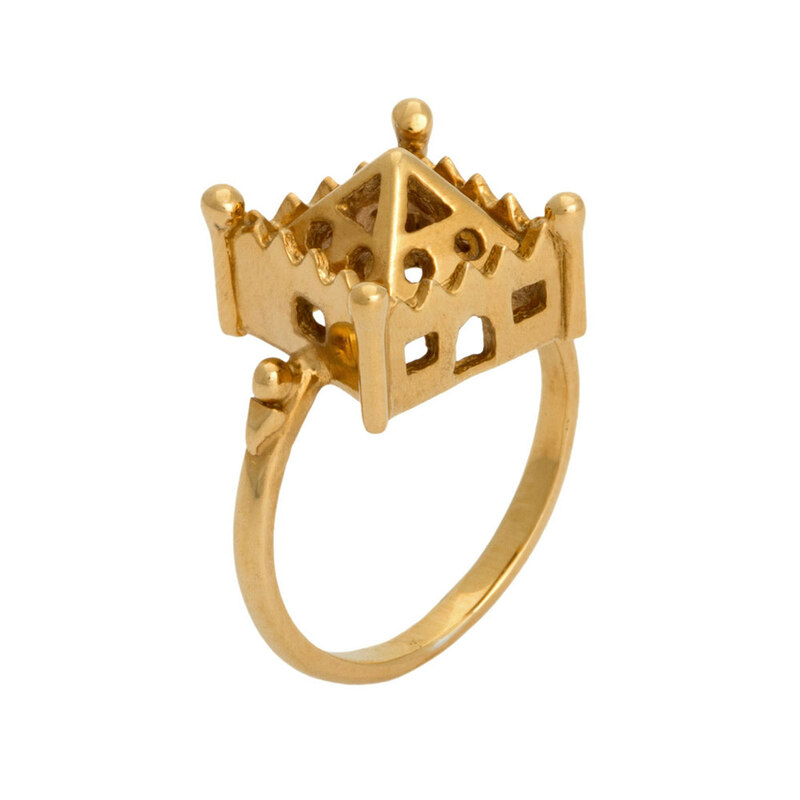 The collection has been designed not just for engagements and not just for Jews, but as a universal symbol of love, harmony and holiness, repurposed for all occasions, a reinvention of this marvelous house ring tradition. 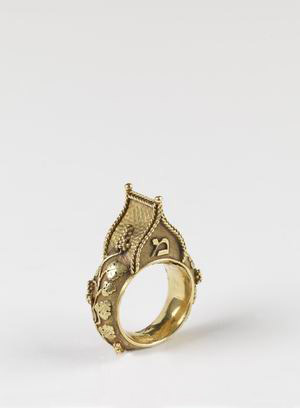 Jewish betrothal rings are one of history's most beautiful secrets. Their sophisticated craftsmanship and distinctive elegance has remained unparalleled, despite the rings almost being forgotten by Jewish communities for hundreds of years. 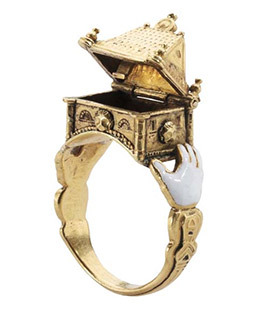 These unique and opulent rings featured wonderful miniature palaces, castles and temples, standing proudly in the place of a gemstone, and were often inscribed with Hebrew. The architectural symbols, which are thought to represent the marital home of the couple (and in some cases symbolised Solomon's Temple in Jerusalem), were often turned into a clasp which when opened read "Mazal Tov" (Good Luck in Hebrew). 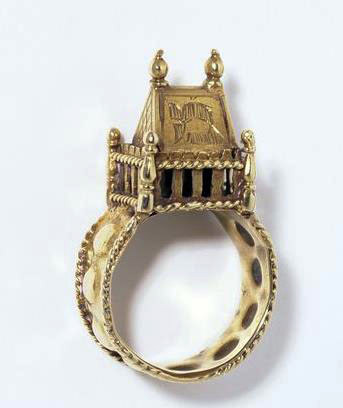 Jewish wedding rings were first documented as an official part of the wedding ceremony in 10th century, though they probably date back much further. The earliest house rings that have been discovered date to 400 years later. In a Jewish wedding ceremony the groom symbolically acquires the bride, this is done with the ring acting in place of money “The groom should give to the bride a plain ring, with a value not less than one perutah” (the perutah was the lowest value coin in biblical times). The lack of value to the ring demonstrates that the bride is not being bought like a piece of property. Rather, the wife's acceptance of the money is a symbolic way of demonstrating her acceptance of the husband. To this day every Jewish wedding must accommodate such an exchange. 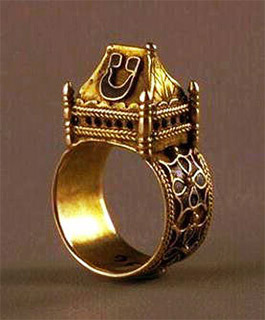 However some Jewish opinions claim that the ring should be plain and made of solid gold with no detail. 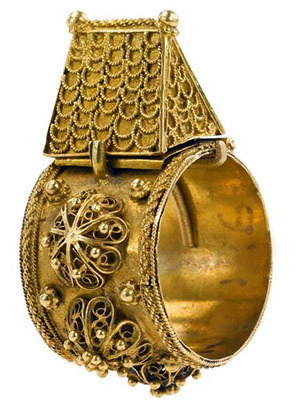 This condition has led some to believe that the ornate wedding rings of medieval Europe were ceremonial engagement rings, and that another plain ring would have also been used during the wedding ceremony. The extravagance and price of the rings has also lead experts to believe that one ring would sometimes be owned and shared by an entire community,borrowed by each couple for ceremonial purposes during the wedding, and then returned. Within rich merchant and banking families the rings were traditionally family heirlooms passed from generation to generation. In the 1340s Europe entered a dark chapter when town after town succumbed to the black death, which killed up to 200 million people. In response to this desperate situation, local communities turned on their Jewish residents, accusing them of starting the plague by poisoning wells and cursing Christians. Thousands of Jews were massacred and hundreds of communities destroyed in the ensuing pogroms. Fearing for their safety many Jews buried their valuables in the hope of one day returning, tragically they never did and their valuables remained undiscovered for centuries. Two of the most famous hoards of treasure to ever have been found from this period were in Erfurt and Colmar. These valuable collections contain two of the most ornate and beautiful house rings ever to have been excavated, shown in the first two pictures above. 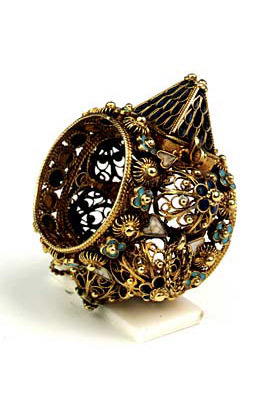 As history advanced, so did the craftsmanship of the rings and they began to take on incredibly intricate filigree and enamelling (as depicted above). 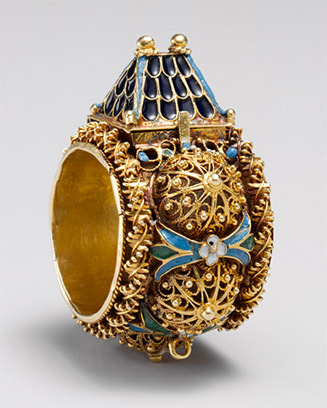 In spite of the incredible and varied examples of decorative work displayed across these rings, gemstones remain notably absent, most likely for religious reasons. 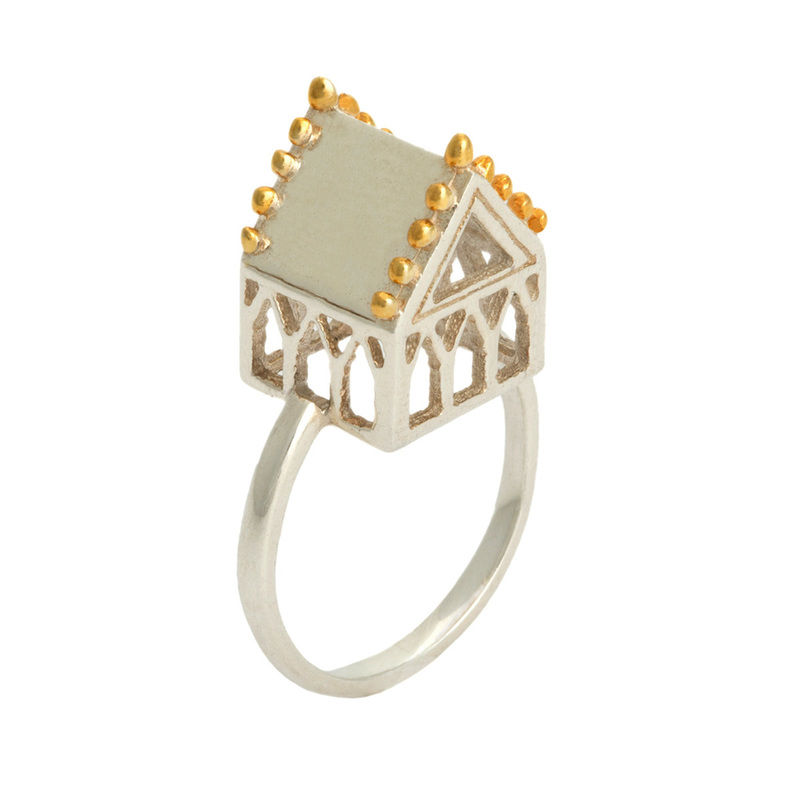 In 2014, I launched my jewellery company Chloe Lee Carson, reintroducing the house ring as a beautiful statement piece of jewellery, designed to be worn. The Hoyz ring collection brings the house ring back as a universal symbol of love, harmony and holiness. Combining the historical origins with contemporary style, these updated designs strike a perfect balance of new yet old.